Khansari Law Corp., APC is centrally located in West Los Angeles and provides legal services to clients throughout all of Southern California. Khansari Law Corp., APC (“KLC”) attorneys practice law at the highest level in the areas of Real Estate, Bankruptcy, Business/Commercial and Personal Injury. Attorney/Founder Andre A. Khansari represents entities and individuals in all facets of commercial and residential real estate transactions and litigation. KLC represents landlords and tenants, purchasers and sellers, commercial and residential real estate developers, joint venture partners, and limited partners. Mr. Khansari has substantial experience and a proven track record of success in representing both commercial and residential landlords as well as tenants with regard to unlawful detainers, evictions and foreclosures. Having practiced real estate law at one of the largest and highly regarded real estate law firms in California, Mr. Khansari brings with him a wealth of real estate knowledge and experience to KLC and KLC’s bankruptcy and insolvency practice, especially distressed real estate financing and transactions. The stress of financial burden seeps its way into our everyday life activities, impeding our work, putting strain on our relationships, and disturbing the tranquility of our home. 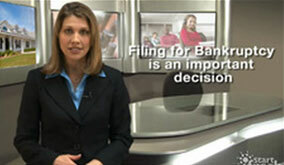 There are a few ways to tell if it is the right time to file for bankruptcy. Some indicators are: If you find yourself using your credit card to buy the bare essentials such as food and water, if you are using one credit card to make payments on another card just to get those creditors to stop bothering you, if you find the stress of financial burden keeping you awake at night, or otherwise disrupting your life. Filing for bankruptcy is not a straightforward answer; there are benefits and consequences. Los Angeles bankruptcy attorneys at Khansari Law Corp., APC can help you weigh out all these factors. Do not start filing for bankruptcy without speaking to an experienced professional first; your decision will not just affect you, but also your loved ones. Our Los Angeles attorneys have countless successful bankruptcy cases under their belts. If you are looking for a professional, look no more. If you feel as if filing for bankruptcy is becoming one of your last options, you should give Khansari Law Corp., APC a call at (424) 248-6688 for a consultation to discuss your situation. At Khansari Law Corp., APC, we are interested in easing your financial burden and reducing as much of your debt as possible. Los Angeles Real Estate lawyers at Khansari Law Corp., APC have years of experience working in real estate. Our attorneys have represented buyers and sellers in the acquisition and disposition of office buildings, raw land, retail centers, hotels…in short, every kind of real estate asset. Attorneys at Khansari Law Corp., APC are not only experienced in the acquisition and disposition of a wide variety of real estate assets, but they can help you with managing these assets. We can help you with document drafting and negotiation (negotiating and composing the broker’s listing agreements, letters of intent, option agreements etc. ), financing (representing lenders and borrowers in real estate loan origination), leasing and many more fields! If you seek additional information, give Khansari Law Corp., APC a call for a consultation to discuss your endeavors in real estate! For more info regarding what Real Estate Transaction services our attorneys provide, check the “Practice Areas” tab on our website. Considering we live in the population-dense city of Los Angeles, it shouldn’t be a surprise that people take their property very seriously. If you are tenant dealing with a landlord, it can be a stressful time as it involves your home. On the other hand, landlords are in just as complicated of a position. Landlord – Tenant disputes contain documents that are time sensitive (3 – Day notice to pay or quit, etc. ), and it is important to be mindful of such time constraints.Los Angeles Real Estate attorneys at Khansari Law Corp., APC have many successful Landlord-Tenant disputes under their belts and can help either party in such disputes. Because our attorneys have experience representing both sides in these issues, we also understand both sides better and are able to mediate effectively; making sure both parties are satisfied. We provide effective legal counsel for property managers, landlords and tenants in cases involving violations of lease agreements, maintenance issues, negligent management of property and evictions pursuant to unlawful detainer actions. For Landlords: We advise clients on lease violations by commercial or residential tenants, and we represent property owners in the California eviction process. For Tenants: We advocate for renters and tenants who have suffered financial injuries, loss of use and enjoyment of the property, or if the property leased has simply become uninhabitable as a result of negligent maintenance by the landlord. Whichever party you may be, we can help! Both Landlords and Tenants deserve satisfaction in these delicate matters; call Khansari Law Corp., APC to begin resolving your Landlord-Tenant issues and get a consultation: (424) 248-6688. Los Angeles attorneys from Khansari Law Corp., APC handle personal injury of all types. If you have been harmed due to someone else’s negligence, we can help! Accidents happen; this is part of life. While no one can decrease the odds of an accident happening. The trusted Personal Injury attorneys in Los Angeles, California at Khansari Law Corp., APC are able to get your life back on track as soon as possible. We will get you compensation for every hardship you endure that is related to your accident. We have experience finding our clients the correct medical staff for their needs, helping them pay bills related to the accident, and holding the guilty party financially accountable for all hardships on you, including all future hardships that may come your way, such as loss of enjoyment of life. Our attorneys have experience with all types of auto-accidents: whether you were driving a car or riding a motorcycle/bike, whether you were hit by a drunk driver, the other driver failed to yield, poor road design, hit by someone texting and driving, etc. If you are the victim of someone else’s negligence, call our Los Angeles attorneys atKhansari Law Corp., APC at (424) 248-6688 for a consultation. The Los Angeles Business Attorneys at Khansari Law Corp., APC are able to help you with all kinds of loan transactions. We can help you document and close a loan transaction, as well as assist a lender with a problematic/defaulting loan. Our attorneys are multifaceted in what experience they bring to the table, as well as what problems we can assist you with. Because of our extensive knowledge, we can see your loan through from the beginning to end. This includes but is not limited to: loan documenting, borrower due diligence, collateral due diligence, and managing security interests. When you seek services from Khansari Law Corp., APC, you get the best of both worlds; attorneys experienced on both sides; we represent borrowers and lenders, landlords and tenants. You can rely on our real estate attorneys to give you extensive information and guidance on both sides of issues. We acknowledge that borrowers can’t always make full repayments on time, and offer advice to remedy this. We give advice to lenders to encourage reasonable loans that promote the best outcome for both parties. The attorneys at Khansari Law Corp., APC believe that the rights of a consumer are paramount. Consumer rights law at Khansari Law Corp., APC is divided into two major fields of law; the first is Lemon Law in Los Angeles, California, and the second is California Proposition 65 Litigation. Consumer Rights are centered around protecting you, the consumer, and usually involve a David and Goliath type battle against a well-equipped and heavily funded conglomerate. Fear not, as our attorneys will fight for your rights and make sure that you are protected from unethical companies. The attorneys here are experts on Lemon Law Cases in Los Angeles, California and understand the complex legal structure surrounding the Lemon Laws in California. If you ever have issues with your vehicle, especially recurring issues that have not been properly addressed by your manufacturer, the attorneys at Khansari Law Corp., APC are here to help you recover what you deserve. In analyzing California Lemon Law, the hinging factor in the majority of the cases is the “reasonable” number of attempts the manufacturer has had to repair the vehicle. “Reasonable” attempts can range anywhere from a single attempt to as many as four attempts. If you having trouble with your vehicle we urge you to call us for a consultation. The attorneys at Khansari Law Corp., APC are also very well equipped to litigate and file lawsuits in regards to California’s Proposition 65 Consumer Rights Law. Proposition 65 is also called the Safe Drinking Water and Toxic Enforcement Act of 1986, and was enacted to maintain clean water, devoid of harmful chemicals, as well as regulate consumer exposure to chemicals found in products distributed throughout California. Our attorneys have litigated cases against some of the biggest companies in the world and found favorable results for our clients. If you believe that you need an attorney for a Proposition 65 case in California we urge you to reach out to Khansari Law Corp., APC.